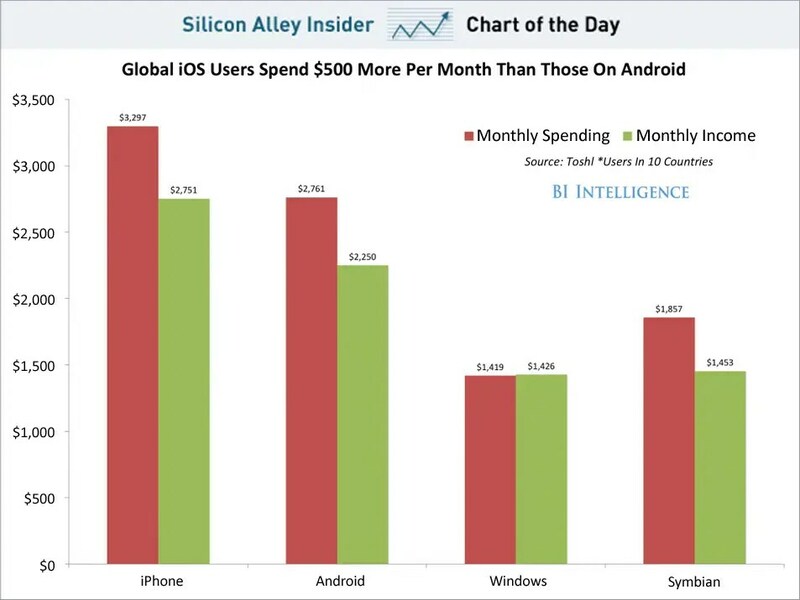 Are iOS users simply wealthier than Android users? Recent data from Toshl Finance, a personal budgeting and expense tracking app, puts numbers to the widely-held suspicion that this is the case. iOS users tracking their expenses on Toshl spent an average of $3,297 every month, 19 percent more than those on Android, who spent $2,761. There’s a similar disparity in terms of income. That may help explain why Google’s Android has lagged Apple in terms of monetizing its huge mobile audience. Of course, there are other factors behind Android’s monetization woes: many Android users run outdated versions of the platform, and consumer credit cards aren’t required for accounts on the main Android app store, Google Play. But the lower spending power of Android users can’t help. The only silver lining for Android is that Windows and Symbian users spent and earned even less.